Perhaps the most difficult question to answer about Doctor Who, despite its 31-and-counting television seasons of storytelling, is "What is Doctor Who about?" The reductionist approach, "It's about an alien who travels through time in his blue box with some companions and has adventures", though literally accurate, is deeply unsatisfying. You could make any number of television series satisfying that description, and not one of them would be Doctor Who. It falls, then, to The Complete Fifth Series (née Thirty-First Series, series being British parlance for "season"), to offer a satisfactory answer to the question at hand. Observers of the long-running, more or less family-friendly, often experimental British sci-fi series shouldn't be surprised; great things have been in store for series 31 for years, ever since the announcement that beloved Who writer Steven Moffat (Coupling, Sherlock) would be taking the helm, steering Doctor Who according to his own preference and writing half the series, as opposed to his usual one or two episodes. There was always the chance that Moffat, reliable in his sparseness, would be a disaster, but by happy circumstance he turns out to be quite as good in prolific form. With a new showrunner comes a new Doctor (Matt Smith, The Ruby in the Smoke), the 11th of the series. He sets himself apart from the winning, grinning manner of Nine and the manic-depressive, unpredictable style of Ten with a renewed embrace of the show's adventure, combined with a not inconsiderable awkwardness befitting his youth. He and his exceptional new companion, Amy Pond (Karen Gillan) complement each other so perfectly that I couldn't imagine a 32nd series without her to be anything but heartbreaking. The Ten/Rose relationship, uniquely romantic among all Doctor-involved relationships over the series run and an obsession of Ten's entire three-year run, comes nowhere close. Choosing a new Doctor is always hard, but Amy seems to have been quite as carefully chosen to fulfill this series, in sharp contrast to the last couple, who seem mostly to have been selected for their unlikenesses of companion Rose of the 27th and 28th series. Series opener "The Eleventh Hour" promises a companion with psychological baggage. She describes the optimism of her childhood, so carelessly trampled by the Doctor, as "a bit fairytale". She's the cleverest so called "new series" (this being the fifth) companion; by my count, she solves the primary dilemma, beating the Doctor to the punch, in a whopping three of the eleven stories of this series, besting previous record-holder Rose by two. This in a show where thinking of solutions is everything and the Doctor is a thousand-year-old know-it-all. Companions have always been expected to hold their own, but Amy seems especially capable. From beginning to end of the series, Amy plays an elaborately composed microcosm of the overarching plot, the best such Doctor Who story of the new series. It combines all the best elements of Moffat villainry, finding terror in everyday things, lacking malice, and destroying the universe, all without falling back on the old series villains yet again. It comes down not to a big, battlefleet finish, like the 27th, but rather to a beautifully written test of the Doctor's connection to his companion in series finale "The Big Bang", itself a wild rush of all the feelings really good Who invokes. The arc is also uncommonly well-paced, with revelations spread throughout the series yet never telegraphed, as opposed to previous arcs that poked you repeatedly in the eye with little hints, saving everything for the big Dalek-infested finale. Not absolutely everything is sunshine and roses, though I only classify three of the thirteen episodes of this series as anything but terrific. "Victory of the Daleks" continues the tradition of bad-to-okay Dalek episodes that started after series 27's "Dalek", though it fortunately qualifies for the upper end of that scale. Two-part deep-under-the-earth tale "The Hungry Earth/Cold Blood" dwells too long on its frustratingly transparent morality tale, and would seem out of place and more at home with Ten, were the final scenes not anchoring it here in this series. Given the experimental nature of Who writing, though, I consider us lucky that this series, unlike the last three, failed to produce a genuinely terrible episode. The other weaknesses of the series are well-masked by its victories. For example, managing far better than "The Hungry Earth/Cold Blood" to drill deeply is mid-season "Amy's Choice", a dark turn after the lighthearted "The Vampires of Venice", but equally bent on deconstructing the relationships between the Doctor and his companions. "Amy's Choice" doesn't treat those relationships with the same nuance as "Flesh and Stone", but far more than makes up for it with its daring to take the characters to such dark places, and willingness to get under the Doctor's skin, more than any new series episode ever has. With regard to the question of what Doctor Who is all about, I'm specifically referring to "The Beast Below", second episode of this series and the first "ordinary" outing for the new Doctor and Amy. It's a sneaky, dissembling little story with so much going on that it can barely contain itself. After you finish, go back and watch the opening dialogue with the Doctor and Amy. Then do it again, perhaps several times, as I did. All the answers are there, if you're willing to look for them. Video: There is a little occasional combing on progressive-scan TVs; as a British series, Doctor Who is shot at 25 frames per second, as opposed to the 23.976 expected by American TVs, so perhaps a few errors were introduced by 2:2:2:2:2:2:2:2:2:2:2:3 pulldown in some places, but I would be surprised had they not simply slowed the video down by 4% as is done with most British/American transfers. Accordingly, most scenes lacked any combing whatsoever, so it's not a major concern. As this is Doctor Who's first series filmed in HD, I expect things to be cleaned up in the future. Audio: One thing I was not expecting was the impressive range of trebles and background noises preserved by this transfer. If you don't have a high-quality sound system, though, I would suggest pushing up the midranges in your equalizer. Unlike some previous transfers, Murray Gold's soundtrack isn't rendered too loudly to distract from the action on screen. Special features: Smith and Gillan turn the pacing up to 11 in "Meanwhile in the Tardis" scenes, though you can see how their inclusion in episodes would have ruined their act structure. In Britain, the "Doctor Who Confidential" documentaries air after each new transmission. They're mostly vacuous, with a scattering of fun moments with Smith and Gillan, and a neat little special effects presentation with Alex Kingston attached to "The Time of Angels". Some commentaries are included with studio video of Moffat et al, laid PIP-style over the episodes, but I wasn't able to get the audio to play. Perhaps I should upgrade my firmware. Or perhaps I enjoy the puppet show too much, and would rather not see the strings. 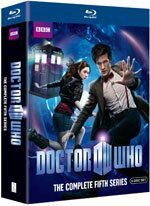 Download Doctor Who: The Complete Fifth Series from the iTunes Store in Digial HD.